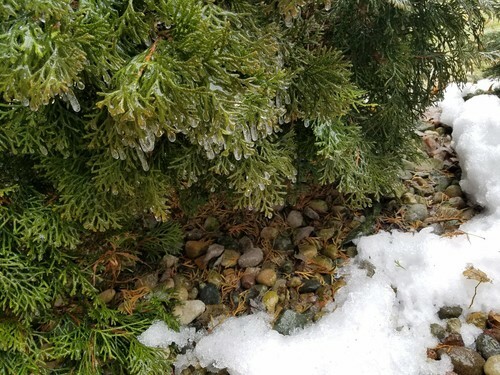 This entry was posted in Seasonal and tagged cold, evergreen, ice, melting, snow, Winter. Bookmark the permalink. It definitely counts as a good thing, Linda, but it’s more from the heavy rains Harper brought than from any melting. In fact, it’s only 12 degrees right now! I wanted to see the eclipse, but no way was I going to stand out in temperatures that raw — the neighbors would have had me hauled off to a facility of some sort — so I satisfied my curiosity by seeing pictures of it. And it was truly exceptional, wasn’t it?! The eclipse was great, as much as I saw. I didn’t wait for totality. I was tired, and I’ve seen so many lunar eclipses, I knew what it would look like. So, I went to bed. Now, here’s a question: who’s Harper? Ah, that’s the name of the winter storm that brought us all that rain. The previous storm Gia was the one that dumped all the snow on us. Gotta love The Weather Channel for naming these beasts, huh?! I’d forgotten that they were doing that. Most of the professional mets I know absolutely hate it — they consider it a marketing device. And truth to tell, I haven’t seen TWC for several years, so it’s no surprise I was out of the loop! If they decide to name one Linda, let me know! I’ll try to remember that!! Debbie, so far we’ve not had much cold or snow this winter. This weekend we were supposed to get a snow storm, yet so far it’s been nothing but rain. However, it IS cold. Have a FAB Sunday, my friend! We got a LOT of rain, too, so much that a lot of the snow we’d had has melted away, thankfully! I’m not a big fan of cold weather, snow, and ice, as you know. And we’ve had such bitterly COLD temperatures with this latest storm. Single digits and temps below zero make me wish winter would hurry off! Excellent poem, Debbie. I feel for you. Thanks, John. I’m sure you remember winter well — probably why you chose NOT to stay in this frigid part of the world, ha! Isn’t that the truth? Glad I’m not the only one, Tanya!! Ooh, I wish I’d been determined enough to brave the cold to see it, too! !